To bed share or not to bed share - this is the question that is often hotly debated on parenting forums. Guidelines often state "in a different bed in the same room", ie no sharing; which would appear to support the notion it's generally a risky business. However what is the evidence behind these guidelines? Explore it (including new research out this month) and we find a very different and more detailed picture about infant sleep; hence debate ensues. The trouble is that just like the starting solids guideline - official recommendations have to be a short snappy piece of information that everyone can understand. A guideline cannot be detailed, discuss different risk factors and provide information so parents can review and act accordingly. Therefore don't bedshare is considered a "key" message. A fact FSID don't dispute. "If you can get people's attention for more than three seconds you would like to give the whole story every time, but at what point do you lose everybody?" There are some reports of infants being suffocated by overlying by an adult, particularly when the adult is in an unnaturally depressed state of consciousness, such as from alcohol or mind-altering drugs. Co-sleeping on sofas has emerged as a major risk factor in 1 study. Others have shown bed sharing with multiple family members in an adult bed to be particularly hazardous for the infant. Although overlying may be the mechanism in some of these cases, soft sleep surfaces, entrapment, and the likelihood of rolling to the prone position in such circumstances also may have a role. The risk of SIDS associated with co-sleeping is significantly greater among smokers. Some behavioral studies have demonstrated that infants have more arousals and less slow-wave sleep during bed sharing, but no epidemiologic evidence exists that bed sharing is protective against SIDS. (remember the bold bit I will come back to that in a moment)"
But is there any evidence at all to suggest an infant is more likely to turn prone when co-sleeping than when in a cot? Why don't the AAP tell us what the actual risks of co-sleeping are in a prepared environment ie not on a soft sleep surface (ie waterbed/pillows and heavy bedding near baby) no risks of entrapment/entanglement, no drugs/alcohol, no unplanned cosleeping ie mum falling asleep sitting up, baby next to mum alone and not in the middle of a family bed AND exclusively breastfeeding - where are these figures? "It is generally accepted that SIDS may be a reflection of a variety of causes of death. A leading hypothesis for a large proportion of SIDS cases is that SIDS may reflect a delayed development of arousal or cardiorespiratory control." "The hypothesis is that certain infants, for reasons yet to be determined, may have a maldevelopment or delay in maturation of this region, which would affect its function and connectivity to regions regulating arousal. When the physiologic stability of such infants becomes compromised during sleep, they may not arouse sufficiently to avoid the fatal noxious insult or condition." Right - but as nobody has done an epidemiological study to prove bedsharing is protective (remind me again where the studies are proving cot sleeping is protective? Wasn't SIDS called cot death for long enough? ), we don't acknowledge any link here? Has there been a a study proving safe bedsharing isn't protective? "Heart rate variability in 2-day-old sleeping babies for one hour each during skin-to-skin contact with mother and alone in a cot next to mother's bed. Neonatal autonomic activity was 176% higher and quiet sleep 86% lower during maternal separation compared to skin-to-skin contact." In basic terms this means separating mother and baby caused significantly more "anxious arousal" and less "quiet sleep". "What is desirable for newborns is to have 'sleep cycling,' which means an even distribution between active sleep and quiet sleep, in periods of about one hour,"
"In our study, sleep cycling in separated babies was mostly absent, and in six of 16 babies that did show some quiet sleep when separated, it was shorter and shallower." The scientists also noted concern that the disrupted sleep patterns and stress to the heart could make it difficult for them to form relationships. This research addresses a strange contradiction: In animal research, separation from mother is a common way of creating stress in order to study its damaging effects on the developing newborn brain. "When babies are smothered and suffer cot deaths, it is not because their mother is present. It is because of other things: toxic fumes, cigarettes, alcohol, big pillows and dangerous toys." "Our study revealed that Lauren breathed better when sleeping next to Martha than when sleeping alone. Her breathing and her heart rate were more regular during shared sleep, and there were fewer "dips," low points in respiration and blood oxygen from stop-breathing episodes. On the night Lauren slept with Martha, there were no dips in her blood oxygen. On the night Lauren slept alone, there were 132 dips. The results were similar in a second infant, whose parents generously allowed us into their bedroom." Dr Mckenna has written extensively on the subject as to why he feels infants are more at risk sleeping alone - yet mainstream media and literature barely gives a nod to these significant findings. 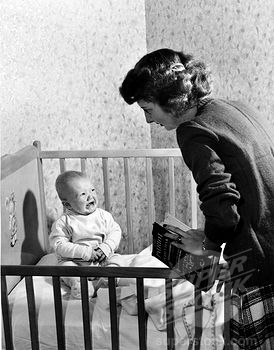 Many studies similarly show that infant mammals, including human infants, appear to be pre-sensitised to receive sensory signals linking them to a co-sleeping partner.40–43 All have been shown to change infant physiology, including heart rate and breathing patterns including increased arousals yet the cessation of excessive night-time crying. Until recently, all human infants experienced access to at least one cosleeping adult body, usually the mother 45,46 so it is not surprising that maternal contact stimulates a variety of signiﬁcant ‘hidden regulatory processes’ that are clinically advantageous to infants." "We found that bed-sharing infants face their mothers for most of the night, and that mother and infant are highly responsive to each other's movements, wake more frequently, and spend more time in lighter stages of sleep than they do while sleeping alone. Co-sleeping makes it easier for a mother to detect and respond to an infant in crisis." Interestingly mum also hits more restful sleep phases for longer. So here we have internationally recognised doctors (not just a random unqualified baby tamer who has written a book) stating actually co-sleeping may be protective against SIDS. That cot sleep may in fact be more risky? This all seems rather a far cry from "don't bedshare" doesn't it? "Co-sleeping dangers. 54% of cot deaths due to co-sleeping! More than half of cot deaths happen when a baby is sleeping with a parent, a study has revealed." At a glance that leaves many parents content they use a cot and off they go.. But even if we take this statement at face value and look no further - it's surely immediately obvious that if 54% of infants were co-sleeping, 46% were in a cot? Hardly a compelling demonstration of cot safety? "Yes – the study found that 54% of cot deaths occurred while the baby was co-sleeping with a parent. But although the risk was strong if they had crashed out on the sofa, it was only significant among those in a bed if the parent had drunk more than two units of alcohol or had been taking drugs." "You can say that half the deaths occurred while babies slept with their parents. You could also say that half the deaths occurred while babies were alone in their cots, he says, but: "I don't see anybody saying, 'Don't put your baby in a cot.'" When babies are shown to have suffocated due to a fabric comforter - the guidelines are updated to say don't use comforters. Ditto cot bumpers and duvets/pillows under one year old. Yet when a baby has been shown to become entangled and suffocated on inappropriate bedding when bedsharing, the guideline isn't "address the problem", but "don't bedshare!" There is also an underlying assumption cots are safe. This article highlight two strangulation deaths of infants with the electrical cords from baby monitors. This the risk of blind cord strangulation when unsupervised (including in cots) I have read stories of babies pulling heavy or dangerous items in on top of themselves, or worse this poor boy who died after becoming entrapped when climbing out. Yet nobody ever suggests not using a cot, instead parents are advised to ensure appropriate measures are taken to make the area safer. Furthermore going back to the study, if only 54% were co-sleeping to start with, once you remove known risk factors and compare the revised figure with those sleeping in a cot, the picture is very different. Even if we move the debate away from the simple argument of which location is safer in terms of statistical outcome. We also need to consider the knock on effect, and therefore possible risks associated with where parents place their baby to sleep. We know that when we tell parents co-sleeping is unsafe, many decide their baby will sleep in a cot. The very real danger with this is that a parent falls asleep sitting up in bed, or on a sofa. Something the above study found was a massive risk factor with regard to SIDS. Every parent of course believes they would never fall asleep when feeding - yet nature delivers a huge hit of sleepy hormones when mum breastfeeds (strange if mum isn't supposed to be sleeping on the job ;)) and despite best intentions many many mums report accidentally falling asleep - including myself (who didn't co-sleep due to ignorance and official guidelines with my first). One mum commented she had to play with her iphone to ensure she stayed awake, others try moving from bed to an upright chair to prevent temptation. The knock on effect of this may be minimal if you have a baby who only rouses infrequently. Throw a frequent waker into the mix however and there is a good chance the mum will a) become overly tired which in itself is listed as a SIDS risk, b) give up breastfeeding believing she needs more sleep to function than the current (PITA) night ritual provides. Yet not breastfeeding is not only linked with SIDS but other significant health outcomes too. In fact the one significant risk factor the vast majority of studies fail to adjust for is feeding method ie breastfed, breastmilk or formula. Those that have demonstrate a compelling link - therefore any that do not, are potentially fundamentally flawed from the start? The definitions of co-sleeping and bedsharing are often blurry, known risk factors not adjusted for and so are parents really getting the big picture? "The study showed that sleeping with the baby on a sofa really is a risk. Yet seven of the parents whose baby died say they had gone to the sofa to feed, aware that bedsharing is said to be dangerous, and had fallen asleep. Any advice to discourage bedsharing may carry with it the danger of tired parents feeding their baby on a sofa, which carries a much greater risk than co-sleeping in the parents' bed,"
"The possible hazards of co-sleeping must be assessed. Is the environment otherwise safe, with appropriate bedding materials? Do the parents smoke? Do they use drugs or alcohol? (These appear to be the main factors in those rare cases in which a mother inadvertently smothers her child.) Since co-sleeping was the ancestral condition, the future for our infants may well entail a borrowing back from ancient ways." Thanks AA! I will be sharing this! This is a fantastic article AA. I'll be sharing it. This is so well written! I am sharing it. Thanks! Wonderful article. I will share widely. Oh I do love you, Armadillo! Is there supposed to be a link to the UNICEF guidelines? Some stats to put this into perspective: 150,000 children die each year in the US as a consequence of motor vehicle accidents. Approximately 2500-5000 SIDS deaths occur per year in the US (many of which are not attributable to bedsharing). One could argue that banning children from automobiles would have a far greater beneficial impact than recommending against bedsharing. But we are generally comfortable with the risks of driving. On the other hand, we are led feel far less comfortable or far more guilty sleeping with our babies despite the risk being orders of magnitude lower. Just thought you might be interested to know how a 'Safe Sleeping' campaign is being promoted in my local area. Many of us are appalled by the focus of the campaign, and the fact that 'feeding' (presumably the breastfeeding, co-sleeping mother) is also targeted so negatively.